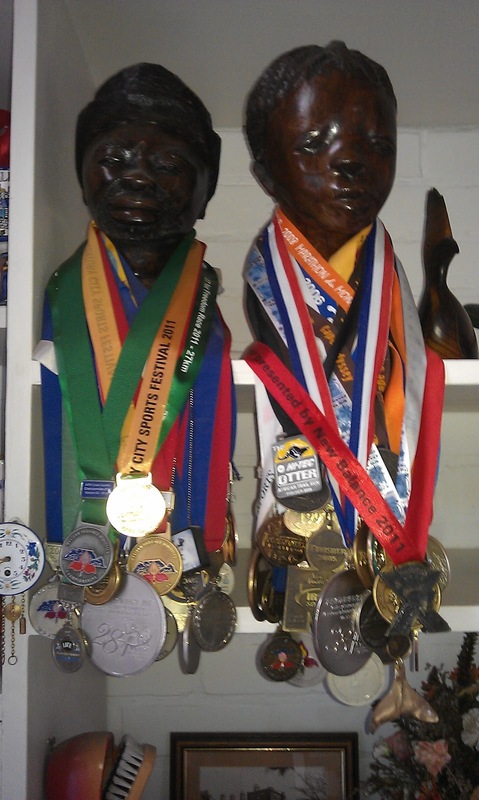 I have been running for a long time and over the years I have collected a lot of medals!!! So many I don't really know what to do with them!!! Now the only medals I take are "special" ones, ones I have earned... A couple of years ago I came 3rd in a race and the young lady at the end handed me a Gold Medal, I looked at it and thought a bit... then asked her if there were any bronze medals, I had come 3rd after all! She told me it was Gold for top 10, Silver till 100 them Bronze, I took a bronze. 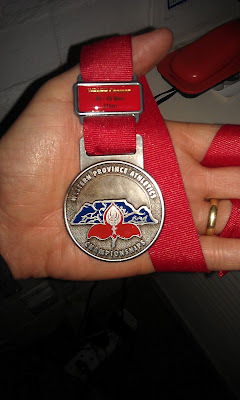 I also keep medal I get from the couple of overseas races I have run, and a couple of races I think I have earned. So what do I do with all these medals? Well I hang them around my head!! Should have stopped at 10! I'm not going to give you a step by step account of the race, but I will tell you that Graham got away and then Sean was just to fast, but Rusta from Gugs and I had a great race with him catching me with the wind behind and me pulling ahead into the wind! That was till the last lap when I got ahead and stayed ahead for the BRONZE. Sorry I don't have a medal to show you, but I didn't stay 3 hours after my race to wait for prize giving. Don't worry I'll get it sometime. 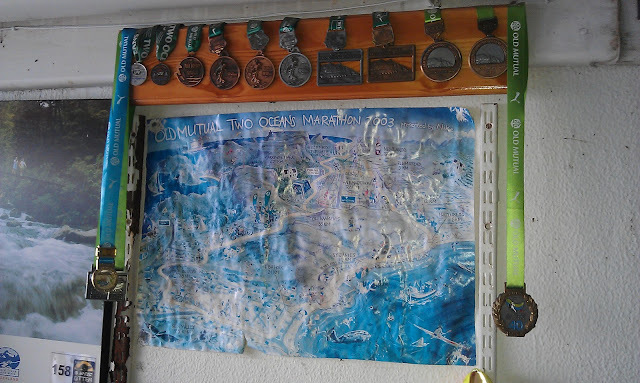 110 trail races, but most of them don't do medals, and some have been 5 day races. WOW. That is A LOT of medals!!! I know they have programs in the US where you can donate unwanted medals and they reuse them and give them to kids. You should definitely be proud of all you have accomplished. I only have one rack of medals thus far but my kids love them. :) You are a great runner and racer. Very cool! Wow. : ) Thats all I've got. haha. Impressive. You could melt them all down and make them into something important - like a car or a robot or a special hat that stops aliens from reading your thoughts. 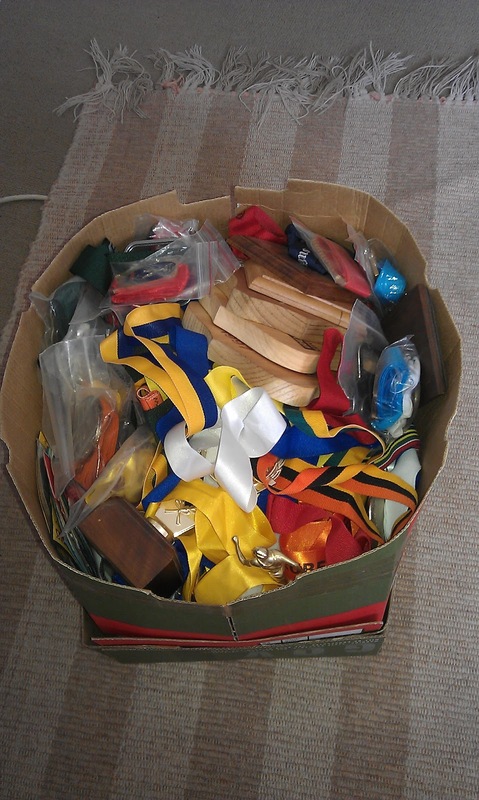 But seriously it's a dilemma to have that many medals. Maybe you should throw your own version of the Olympics. Wow, that is insane how many races you've done. Well done all around. Yea, with your speed you should have been out on the Olympic marathon course! http://www.medals4mettle.org/ I donated about 50 of mine a few years ago. It was a bit pricey to ship, but worth it. Like you said, the majority of mine were sitting in a box.